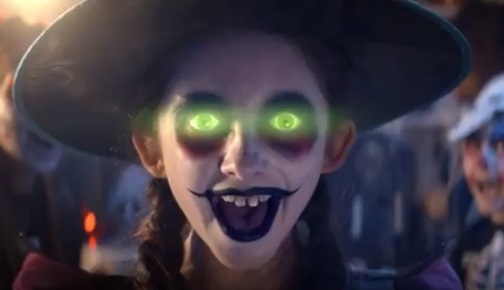 Asda advertises its Halloween costumes for kids, starting from £7, in a new advert. The 30-second spot, titled “Home For All Things Haunted,” opens with a man reading a newspaper whose first page includes an article about a witch spotted in a supermarket, who finds a witch right next to him, after turning a page. Next, kids and their parents – all dressed in scary Halloween costumes – are also seen shouting as they get scared by all kinds of things, such as a dark grey canary, slices of bread jumping in the toaster, and more. A woman gets frightened by a costumed child, a man dressed as Dracula practices his scream in the mirror, waiting for the kids to trick-or-treating. The spot ends with the voiceover saying “Home for all things haunted and kids’ Halloween costumes from £7” and adding the supermarket chain’s tagline, “Save money. Live better”. The soundtrack music is the 1984 hit single “Somebody’s Watching Me” by American singer Rockwell, which features guest vocals by brothers Michael Jackson in the chorus and Jermaine Jackson as additional backing vocals. The song, which became a major commercial success internationally, topping the charts in numerous countries, is included on Rockwell’s debut studio album of the same name.